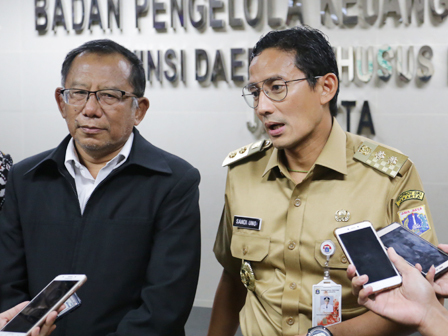 Jakarta Deputy Governor, Sandiaga Uno revealed, his party has got assistance from the Jakarta Development Finance Comptroller (BPKP) in order to Road to WTP.
" Alhamdulillah (thank God), we've got assistance of Jakarta BPK Representative"
According to him, his party has entered a crucial period, as it is nearing the end of the year. Thus improvement in accordance with the record of the Supreme Audit Agency (BPK) should be completed soon. "Alhamdulillah (thank God), we've got assistance of Jakarta BPK Representative," he expressed, at Jakarta City Hall, Monday (12/18). It is conducted to ensure all matters relating to the possibility of influencing BPK's opinion in 2018 can be anticipated. It targets the acquisition of opinion to obtain WTP for 2017 financial report. His party has deadline up to February 2018. Currently the city's assets that have been validated and verified by SKPD/UKPD have hit 98.9 percent. From Rp 421 trillion, it has been noted that 4 trillion is not yet verified and validated. It is hoped all could be completed soon and will be continued to Jakarta Inspectorate for further investigation. "So its process will be monitored routinely," he stated. Jakarta BPKP Representative Head, Bambang Utoyo uttered his presence today is to ensure whether the city is working on the track or not. His party also continues to coordinate with BPK for its implementation. "We also communicate with BPK," he stated.